The science behind pratikraman (asking for forgiveness with repentance) is that you can ask for forgiveness for hurting someone without even saying a word and it will be considered true repentance. You might ask yourself, is this kind of repentance possible? Yes, even if you are physically away, you can remove the feeling of difference between you, by using the scientific process of bhaav pratikraman (reversal of aggression in thoughts, speech and action by changing the inner intent). This means that you no longer have to carry feelings of hurt around with you because true repentance has occurred. 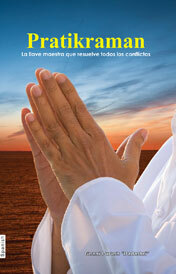 Many people around the globe have experienced the power of pratikraman – it is medicine for the mind. 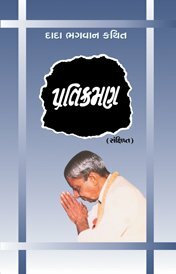 They have found internal peace with everyone and everything around them, thus destroying the very root of hatred and abhorrence using bhaav pratikraman, which was shown by Gnani Purush Param Pujya Dadashri. Knowledge of the Self is the path of liberation. Pratikramans after Self-realization puts you on the path to liberation. 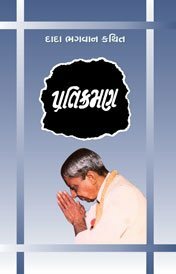 It is alochana(confession of one's mistakes), pratikraman(asking for forgiveness), and pratyakhyan(firm resolve and determination never to repeat the mistake). These will fuel your vehicle en route to moksha. The way to moksha is through these, no other rituals are needed. This is what I myself have done for countless lives. For so many lives I have done alochana, Pratikraman. It will be enough to do just this (Pratikraman) and nothing more. You need not seek any other religion. I am giving you my guarantee and am blessing you for liberation. I will be with you the entire way, giving you my full support. All that is required of you is your readiness. If you were to apply any of this in your daily life, it will be enough. It is natural for humans to err, but how can they escape from this? Only a Gnani Purush can show you how. It is through pratikraman! You should ask Dada for strength in everything. 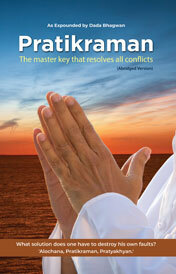 If you fail to do pratikraman, you must ask for the strength to do proper pratikraman. Ask for all the strength. I have as much strength as you need. With pratikraman, his/her animosity towards you will lessen. With each pratikraman, a layer of karma is shed. Karma comes in layers, as do onions. You will have to do as many pratikramans as the number of layers you have caused. The mind is not as much of a problem as the speech is, because the mind functions secretly, whereas speech can carve a hole in a person's heart and hurt him severely. You must ask for forgiveness from whomever you have hurt with your speech. You must recall each and every person and do pratikraman in their name. If you hide things from the Gnani Purush, it will hinder you. People do pratikraman in order to bring things out into the open. That man brought so much baggage with him and he came here to confess everything. What happens when you try to hide things? Your faults will remain hidden and they will double. This is Akram Vignan. 'Vignan' means that it is a Science and therefore it gives immediate results. Where there is no need to do anything, that is called a science, and wherever one has to do something, that is all relative religion. 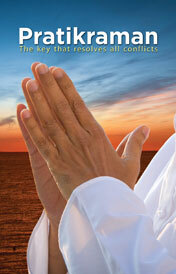 "This is the cash bank of Divine Solution." The only 'cash bank.' Such a bank has not appeared in the last one million years. It offers liberation within just two hours. I am ready to grant you whatever you ask of me.